Private foreign direct investment (FDI) in the forest sector considerably exceeds public official development assistance (ODA). In recent years, forest financing has been characterized by an increase in FDI into developing countries to approximately US$8-10 billion a year, and a decline in ODA to about US$1.75 billion a year. However, current levels of investment in the forest sector, both domestic and foreign, fall far short of investment requirements necessary to realize the potential of well-managed forest resources to contribute to poverty alleviation, the protection of vital environmental services, and sustainable economic growth in developing and transition countries. Explore the willingness of forum participants to support a process to develop clearly defined and mutually compatible social, economic and environmental investment guidelines specific to the forest sector. 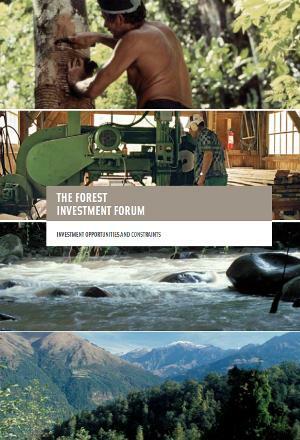 The Forest Investment Forum report includes the forum organizers' outcome statement, a summary of discussions, and an analysis of opportunities and key constraints to environmentally and socially responsible private sector investment in the forest sector. Insecurity of raw material supply and political instability. These represent risks for investors and threaten the continuity of manufacturing operations. Special emphasis was given to the need for the reform of timber concessions, with the aims specifically of: introducing greater transparency into timber allocation processes; involving local communities in the dialogue; achieving equitable revenue sharing; encouraging value-added processing; and guaranteeing to responsible timber companies the long-term security of raw material supply. Illegal logging and forest-related corruption. Illegal activities in many countries are a deterrent to responsible private sector investment. Numerous initiatives have been launched to address these issues, and some governments have displayed a willingness to put the issues of forest-related corruption and improved forest governance high on their agendas. Lack of environmental assessment procedures and safeguard policies. This can both deter socially and environmentally responsible companies and encourage investment by irresponsible operators. Weak institutional mechanisms for the monitoring of environmental procedures and safeguard policies furthermore can impede the implementation of such procedures and policies. Lack of consensus on independent certification. There is much confusion in the marketplace over the merits of the different certification schemes. Attempts to achieve mutual recognition so far have been unsuccessful, and the emphasis has shifted to development of minimum standards or legitimacy thresholds, and to the definition of processes for measuring step-by-step progress toward SFM. Inconsistent strategies for the protection of high-conservation-value forests (HCVFs). The different strategies employed by industry and conservation groups to protect HCVFs and to integrate biodiversity protection into forest management practices must be brought into accord. Debate on the impacts of plantation-based forestry. Given the worldwide trend toward greater reliance on plantation forests, there is a need for agreement between the conservation community and industry on where and how plantation forests can be developed such that any potentially negative social and environmental impacts can be avoided. Small-scale farm and community-owned plantations can play a key role in contributing to income generation and to economic growth. Markets for forest environmental services are underdeveloped. An enabling environment must be developed to help accelerate private sector investment in environmental services such as carbon sequestration, biodiversity protection, and water services must be encouraged through developing an enabling environment for such investment. Encouraging progress has been made in recent years, and some 280 deals have been concluded. However, uncertainties about these markets and their potential financial benefits remain a constraint to the replication of such deals. The financial mechanisms and technical assistance support for small and medium-size forest enterprises are inadequate. The forum discussed opportunities for partnerships between larger forest industrial companies and small-scale, low-income producers. A number of partnerships are making a significant contribution to community livelihoods and to resolving problems such as the clarification of land rights. However, community bargaining power and the ability to mobilize capital remain weak.